If you read my post on Catemaco then you will know that leaving there we had a small problem with our onward travel plans. The station there was quite small and we had very limited options of onward buses. So we had decided to return to Veracruz where we knew they had a large station with heaps of bus options. After arriving back in Veracruz we surveyed the bus timetable and decided to change our travel plan to the border to go through Oaxaca. At that time of the afternoon we couldn’t get a bus all the way to Oaxaca as it would arrive in the early hours of the morning which we wanted to avoid. 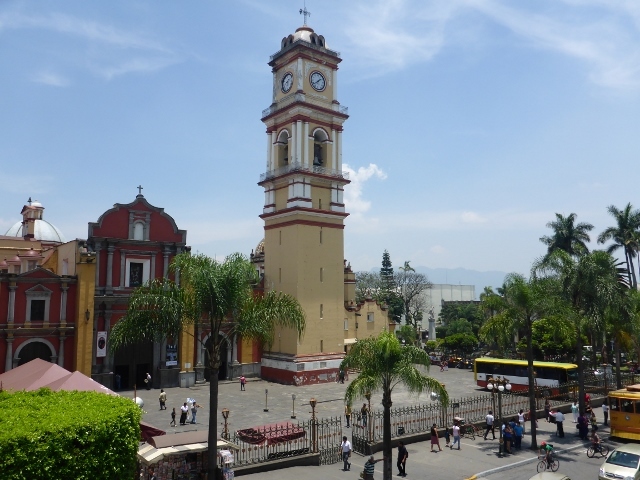 Instead we took a shorter bus to a town called Orizaba which sits in a valley overlooked by the tallest mountain/volcano in Mexico. Sounds pretty right? In the bus station of Veracruz we even had time to use the internet to look at Google maps for Orizaba as well as some quick accommodation research. With a definite plan we were feeling a lot more relaxed and happily hopped on the bus. For some reason this bus didn’t agree with me and I was travel sick for the first time is ages. I’d been doing so well with the buses until here.